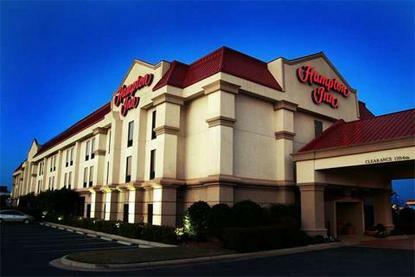 Hampton Inn Warner Robins is located in the Galleria Mall area close to restaurants and retail shopping. We are 7 miles from Lewis B. Wilson-Macon Airport and 5 miles from the Museum of Aviation. Within .5 mile you can dine at Buffalo's, New China Buffet, O'Charley's, or Steak and Shake. We are a 3-story hotel with extra large rooms, queen beds in double rooms, two-room suites, one-room suites,whirlpool suite, 2 phone lines with voice mail, high speed Internet access, microwave/refrigerator (available in all rooms), indoor heated pool, Jacuzzi, and sauna. Amenities include complimentary continental breakfast and newspaper, in-room coffee maker, and TV with cable. We also offer connecting rooms, cribs, express checkout, exercise gym, iron & boards, hairdryers, and business center. Laundry/valet services, guest laundromat, meeting/banquet facilities, audio visual equipment, safe deposit box, secretarial service, golf, and rollaway beds are available for a nominal fee.